The Honda Sensing Suite includes many great features. An intelligent suite of safety and driver-assistive technologies designed to alert you to things you might miss while driving. 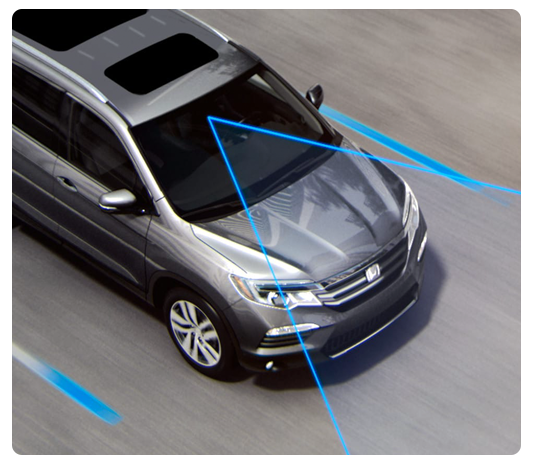 Honda Sensing® features are available or standard on most Honda vehicles. Standard on Touring. Available on LX, Sport, EX, EX-L and EX-L V-6 models with automatic transmission. Standard on Touring. Available on LX, EX, EX-T and EX-L models with automatic transmission. Standard on EX and EX-L. Available on LX and Sport. Standard on EX, EX-L, and Touring. Standard on Touring and Elite. Available on EX and EX-L models. Standard on RTL-E and Black Edition models. "Inver Grove Honda completed the 15,000 maintenance minder service on my 2017 Black Edition Ridgeline efficiently and effectively. Got me a discount on service and even a wash!! Thank you and see you again soon."